With Lightroom 5, previews got quite a bit smarter. Lightroom has always used previews, generated from the original library image, as a way to speed up navigation in the Library module. With a preview, the original doesn’t have to be loaded and rendered each time you view an image. However, previews have typically been low resolution images, not suitable for any kind of sharing, and certainly not suitable for editing in the Develop module. 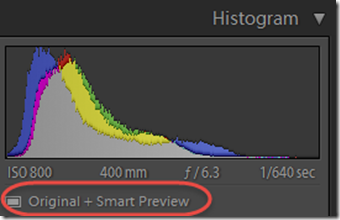 Now, with the new Smart Preview feature, Lightroom creates a “Compressed DNG” preview – an image small enough to display quickly and save on disk space, but large enough that you can use it for Develop module edits, and even for exporting and sharing. In the video below from Adobe TV, Mikkel Aaland shows you how using Smart Previews facilitates working even when your images are offline and unavailable. Once you’re comfortable with Smart Previews, check out my video showing how using Smart Previews can create an automated, portable catalog workflow across two computers. This entry was posted in Lightroom, Tutorial, Video and tagged Lightroom, Smart Previews. Thank you. I am now convinced that even though I am not a professional photographer, smart previews can only benefit my workflow and editing as I am now keeping all my images on external hard drives and would still be able to access them even if my hard drive were not plugged into my computer for some reason.